Kraus family of the Colby area but no F. Kraus found. Also tried "Krause" and "Kruse"
April 4, 1902: "There were confirmation services at the school house Easter Sunday. Those confirmed were: Freda Kreissig, Clara Braun, Oscar Horn, and Minnie Colbaum." March 19, 1915: "Deceased (Stephen Butcher) met a very untimely and sudden death on Friday, Mar. 19, 1915, when at the Kreissig and Schwarze Saw Mill after a load of lumber. He was taken very suddenly with apoplexy and died instantly before any of those who witnessed the scene could reach him...."
Emma Matilda Hessel was born in Saxony, Germany, Aug 23, 1849. On July 23, 1876 she was united in marriage to Henry (Julius) Kreissig. They came to America in 1882 and lived at Sheboygan until 1887, when they came to Clark Co, Wis. Two children were born to Mr. and Mrs. Kreissig, they being Ernest Kreissig and Mrs. Wm. (Freda) Schlinsog, both of Greenwood. Deceased left this world on Dec. 21, 1923, being 74 years, 3 months and 28 days of age at the time of death. Her husband died on Jan. 7, 1901. She is survived by her two children, one sister and four brothers. Funeral services were held from Immanuel Reformed Church on the West Side. The remains were laid to rest in Immanuel Cemetery. The wedding of Wm. A. Schlinsog and Miss Freda, daughter of Mrs. Julius Kreissig, occurred at the home of the bride April 3, 1907. The bride was attended by Miss Emma Schlinsog of Chicago and Miss Martha Schlinsog of Granton, as maids, while Messrs. Fred Schlinsog and Adolph Geisler acted as best men. Among the hundred and fifty guest present were Mrs. Amelia Schlinsog, mother of the groom, and Albert and Maggie Schlinsog, his cousins, of Granton Mrs. Annie Johnson of Eau Claire, Mr. and Mrs. Adolph Biel of Lynn, and Henry, Herman and Charles Schlinsog of Chicago. Mr. and Mrs. Schlinsog are at home to their friends at the Kreissig farm. William August Schlinsog, 78, a former officer of the Town of Mead, Clark Co, died of a heart attack, June 21, 1956, at his farm home, nine miles northwest of here. He had been in poor health for some time. Mr. Schlinsog served as town chairman for 12 years and also as town clerk for many years. He was a former secretary-treasurer of the West Side Telephone Co. here and held various offices in Trinity Lutheran Church at Christie. Services were held at that church and burial was made in the Greenwood Cemetery. Mr. Schlinsog was born in Granton July 6, 1877. He married Frieda Kreissig 49 years ago and since then had resided at his present farm home. His wife and a daughter, Mrs. Leonard (Mabel) Jensen, of Longwood, survive him. Other survivors include a brother, Herman, Granton three sisters, Mrs. Laura Biel, Chili Mrs. Bertha Keller, Abbotsford, and Mrs. Anna Guk, Marshfield one foster-sister, Mrs. Bertha Hessel, Abbotsford. He was preceded in death by one son, Alvin. Mrs. Ernest Kreissig passed away at her home nine miles northwest of Greenwood, Monday evening, Nov. 19, 1934, after an illness of two years duration. Deceased was born in Richland County, April 11, 1888(parents: Charles and Jane nee Williams Dary). She is survived by her husband and two daughters, Hilda and Ella, also two sisters, Mrs. Ben Thomas at Hurley and Mrs. Ernest Mews at Auburndale, two brothers, Harlen and Otto Dary. Funeral services were held from the home. Burial took place in Braun Settlement Cemetery. Miss Ella Kreissig, town of Warner, daughter of Ernest Kreissig, married to Harry Welch, son of Mr. and Mrs. Ben Welch, Auburndale, on April 22 in the Presbyterian manse at Arpin. Mrs. Ernest Mews, who attended as matron of honor, and Mrs. Leonard Jensen, the bridesmaid. Thomas Welch attended the bridegroom as best man, and Earl Welch as groomsman. Immediate relatives were entertained at a wedding supper and a reception was held for 30 guests at the home of Mr. and Mrs. Ernest Mews. Present from out of town were Mr. and Mrs. Thomas Welch, Mr. and Mrs. Henry Grasman, Eli Welch, Emil Nelson and Earl Smith, Burlington; Mr. and Mrs. Merlin Walton and children, Waukesha; Mr. and Mrs. Russell Thomas, and Mrs. Ben Thomas, and Paul Kachato, Pence. Mr. and Mrs. Welch will make their home at Greenwood, where the bridegroom has rented the Ernest Kreissig farm. Mons A. Krogness, 88, son of Arne Monson Krogness and Synne Vaago Krogness, was born near Raudeber, Post Office, Nordfjord, Norway on Feb. 22, 1856. He served his apprenticeship as a carpenter in Norway and he immigrated to the United States in August 1881, settling first in Cambridge, Dane Co., Wis where he continued to work at his chosen trade, until declining years and poor health forced him to retire from such work. On Sept. 10, 1882 he was united in marriage with Martha Caroline Simonson(b. 14 Aug 1858, d. 7 July 1908, daughter of Ula and Martha nee Nielson Simonson) at Greenwood. After their marriage they returned to Cambridge and continued to make that their home until 1893 when he with the family moved to Mason City, Iowa, where they resided until moving to Greenwood in 1895. Here Mr. Krogness purchased 80 acres of land located 1 Â½ miles northeast of the city. From said 80 acres of mostly virgin timberland was carved the modern family homestead with the assistance of his family. He passed away Aug 25, 1944 at the farm home of his son Olaf Krogness and family 1 Â½ miles east of Greenwood, with whom he had been making his home since the 17th day of last May. Surviving are three sons, Olaf of the town of Eaton, Adolph of Sioux City, Iowa, and Carl of the town of Beaver. His wife and five children have preceded him in death. Four children died in infancy. (Greenwood Cemetery: three Krogness daughters, no birth or death date; 1 Krogness infant son, no name May 26/June 26 1901) His son Joseph died on Oct. 20, 1932. Funeral services were held at the old farm home. He was laid to rest in the Greenwood Cemetery. Those from out of town who attended the funeral were: Adolph Krogness, now stationed at Camp Wolters, Texas; granddaughters Caroline and Helen Krogness, and their mother of Neillsville; and Arthur Johnson of Humbird. Adolph M. Krogness, 80, Sioux City, Iowa, formerly of Greenwood, died unexpectedly Dec. 17, 1967 in Sioux City. Services were conducted at the Hill Funeral Home in Greenwood with the pastor of Our Savior's Lutheran Church, Greenwood, officiating. Burial was made in the Greenwood Cemetery. Mr. Krogness was born (to Mons and Martha nee Simonson Krogness) Jan. 12, 1887, at Cambridge, Wis. He came to Greenwood with his parents at the age of eight years, and received his education here and at the La Crosse Business College. Following graduation, he went to Sisseton, S.D., and 41 years ago he moved to Sioux City, Iowa. He never married. His only survivor is a brother, Carl Krogness, Owen. Two brothers preceded him in death. Carl B. Krogness, 84, a former Greenwood resident who had been at Neillsville Memorial Home since December, passed away there April 24, 1977. Funeral services were held at the Rinka Funeral Home at Greenwood. The pastor of Our Saviour's Lutheran Church, Greenwood, officiated. Interment was made in the Greenwood Cemetery. Carl Krogness was born(to Mons and Martha nee Simonson Krogness) on Sept. 29, 1892, at Cambridge in Dane Co and received his education at rural Greenwood Schools. He came to the Greenwood area with his parents in 1895. He moved to a farm in the Town of Beaver in 1942, where he farmed and worked in the woods. He was never married. He was a veteran of World War I. A wedding took place at the residence of Dr. and Mrs. S. M. Kyes on June 4, 1919, the contracting parties being Mr. Joseph M. Krogness of Greenwood and Miss Gladys V. Nelson, who has lived for some time at the home of Dr. Kyes. The duties of the best man were ably carried out by Mr. A. M. Krogness of Milbank, S. D., a brother of the groom. The bridal couple left the same evening for the town of Warner near Greenwood, where they will make their future home on the Krogness farm. Funeral services for Mrs. Gladys Helsten, 85, of Bethel Convalescent Center, Arpin, were conducted at Rux Funeral Home, Spencer. Mrs. Helsten died at Bethel Convalescent Center, Arpin, May 15, 1980. Officiating was the pastor of Trinity Lutheran Church, Unity. Interment was in the Greenwood Cemetery. Gladys Nelson was born to the late Hans and Emily (nee Noyes) Nelson on Feb. 28, 1895 (10 Sept 1894 per cemetery records) in Clark Co.
She was married to Joseph Krogness on June 4, 1919. He died in 1932. In 1958 she was married to Elmer Helsten(as his second wife) at Ogema. He died in 1978. She farmed at Route 1, Spencer all her life. She was a member of Trondjhem Lutheran Church, Greenwood area. Surviving are five children, Verle Krogness of Bloomington, MN; Mrs. Walter (Helen) Bandura of Tripoli; Mrs. Frank (Caroline) Veserat of Madison; Lloyd Helsten of Route 1, Spencer and Robert Helsten of Route 1, Spencer one step-child, Mrs. Karl (Jean) Kroeplin of Stratford. She was preceded in death by one grandson and one brother. Olaf Krogness, 77, Greenwood died at at Memorial Hospital in Neillsville, where he had been a patient for about three weeks. The cause of death was given as a cerebral thrombosis. Funeral services were conducted at Our Savior's Lutheran Church. Burial was made in the Greenwood Cemetery. Mr. Krogness was born (to Mons and Martha nee Simonson Krogness) Aug. 9, 1885 in Cambridge. His wife, the former Elizabeth Engelbretsen, died April 1, 1958. Mr. Krogness farmed in the Greenwood area for many years. He is survived by four sons, Conrad, Emory and Stewart, all at home, and Arthur, Menomonee Falls; two brothers, Carl Krogness, Greenwood; and Adolph Krogness, Sioux City, Iowa. Stewart Clayton Krogness, 69, died May 25, 1995, at his home. Burial was in the Greenwood Cemetery. Stewart Clayton Krogness was born on Feb. 6, 1926, in Greenwood, to Olaf and Elizabeth (nee Englebretson) Krogness. After graduating from Greenwood High School, he served overseas in Japan and the Phillipines during WW II for two years. (US Army; Tec 5; 4th Platoon 6 Special Sv. 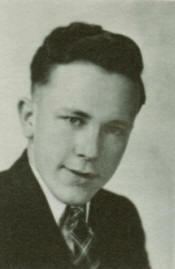 Co.) He then attended the University of Wisconsin for two years. He then returned to the family farm, where he farmed and lived until his death. Survivors include three brothers, Art Krogness, Waukesha and Conrad and Emery Krogness, both of Greenwood. He was preceded in death by his parents. Emery Kenneth Krogness, 68, Greenwood, died Aug 3, 1996, at his home. Burial was in the Greenwood Cemetery. Emery Kenneth Krogness was born on Aug. 3, 1928, in Greenwood, to Olaf and Elizabeth (nee Englebretson) Krogness. He received his education at Greenwood Public School. After his schooling, he served in the U.S. Military during the Korean Conflict for four years. After returning home he worked as a farm laborer all his life. Survivors include two brothers, Conrad Krogness, Greenwood and Art Krogness, Waukesha. He was preceded in death by his parents and one brother, Stewart. Mr. Hubert Kuehn and Miss Lena Seibold were quietly married last Wednesday evening. They are making their home on the farm that he has rented from his father (Greenwood). Services were held at Immanuel United Church of Christ, Greenwood, for Hubert Kuehn, 94, Greenwood, Clark Co. He died Oct. 31, 1987 at the Stanley Nursing Home. Burial was in the West Side Cemetery. Pallbearers were Allan Hodnett, Lynn Hodnett, Robert Abramczak, Dennis Stephan, Dale Kuehn, Bernard Orsburn and Larry Hodnett. He was born Aug. 31, 1893 to Ferdinand and Mary (nee Scheid) Kuehn in the Town of Warner. He received his education at Decker and German Reformed Schools in the Town of Warner. When he was 17 he moved to Horicon, where he worked as a laborer at the Van Brunt Manufacturing Company until 1911, when he moved back to the family farm. He farmed until 1958, but continued living on the farm in retirement until 1967, when he moved to the City of Greenwood. He married Lena Seibold Nov. 11, 1914 at Greenwood. She preceded him in death May 31, 1983. Surviving are a son, Harold(1920-2001), Owen; two daughters, Mrs. John (Avalyn) Stephan, Waldo and Mrs. Harold (Eileen) Hodnett, Withee. Preceding him in death besides his wife and parents are three sons(Norbert 1915-1967; Floyd 1922-1923; Evan 1928-1974), one sister(Kathryn nee Kuehn Geisler 1891-1981), one brother(John Kuehn 1895 '1981) and one half-brother(Helmuth Siems 1904'1983). Mrs. Hubert (Lena) Kuehn, 89, of 118 N. Andrews, Greenwood, died May 31, 1983 at Memorial Hospital, Neillsville. Funeral services were at Immanuel United Church of Christ, and interment was in the West Side Cemetery. Serving as pallbearers were grandsons, Lynn Hodnett, Allan Hodnett, Larry Hodnett, Mark Stasek, Lee Happel and Dale Kuehn. Lena Seibold was born on March 4, 1894, in the Town of Warner to Andrew and Lena (nee Conrad) Seibold. She received her education at Braun Settlement School. 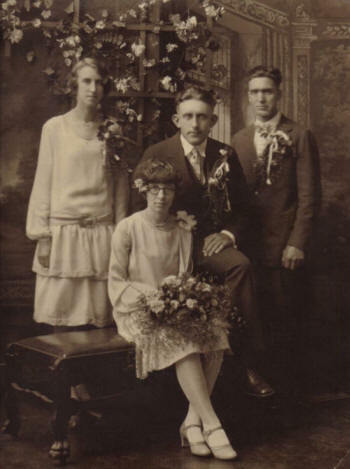 On Nov. 11, 1914, she and Hubert Kuehn were married in the Town of Warner. After their marriage, they farmed in the Town of Warner. For the past 16 years, they have been living in the City of Greenwood. Survivors include her husband, Hubert two daughters, Mrs. Harold (Eileen) Hodnett of Withee and Mrs. John (Ivalyn) Stephan of Waldo, Wis. one son, Harold Kuehn of Owen one brother, John Seibold of Greenwood one sister, Mrs. Alfred (Ina) Laabs of Mauston. Preceding her in death, besides her parents, were three sons, two brothers and two sisters. Mr. Helmuth Siems and Miss Mina Westphal were married July 2, 1927, at the brides' home. They were attended by Mr. Floyd Christman and Miss Lena Stafford. Helmuth Siems, age 79, of Port Edwards, a Neillsville native, died June 6, 1983, at Riverview Hospital, Wisconsin Rapids, where he had been a patient since May 31. Services were at the United Methodist Church, Port Edwards. Burial was in the Village of Port Edwards Cemetery. Helmuth Fred Siems was born March 15, 1904, in Neillsville(delayed birth record V46, pg 161, dated 18 Oct 1941) to Mary (nee Siems) and Ferdinand Kuehn(his parents were divorced at the time of his birth so Helmuth could not have surname of Kuehn). He married Mina May Westphal July 2, 1927, in Clark Co. She died August 11, 1971. He moved to Port Edwards in 1941 and was employed as a millwright by Nekoosa Papers Inc. at its Port Edwards Mill. Surviving Helmuth include a sister, Frieda (Leo) Young(already deceased in 1976) of Davenport, IA, two half-sisters Luella (Albert) Mohr of Neillsville, Clara (Harold) Below of Stockton, IL, one half-brother, Theodore (Doris) Kopp, Sr.; three sons, James of Port Edwards, and Floyd and Henry of Wisconsin Rapids; one daughter, Helen of Port Edwards. Preceding Helmuth in death was one son(born, died 2 March 1934, no name) and two grandchildren. Mrs. Joseph (Mike) Kopp of the Town of Pine Valley died Monday. A goiter of long-standing and large growth was operated Saturday and she failed to rally. Funeral Services were held the Schiller Funeral Home and at the Reformed Church. (The following added information now being added by granddaughter, Dolores Mohr Kenyon.) Mrs. Joseph Kopp of the Town of Pine Valley died on Monday, June 18, 1934, at the Neillsville Hospital, following a goiter removal operation on Saturday, from which she failed to rally. Mrs. Kopp was born(St. John's of Bensenville, Il church record) Maria Sophia Margaretha Siems to Henry and Louisa nee Pingel Siems in DuPage County, IL, on July 23, 1883. (Mary Siemms first married Ernest Ferdinand Kuehn on 13 July 1901, CC marriages V2, pg 326; they were later divorced.) 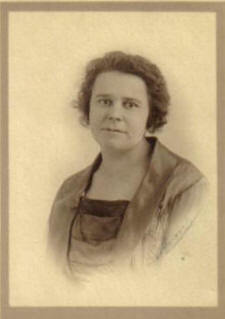 She was married(second) to Joseph M Kopp(1882-1961) on March 19, 1919. Mary is survived by her husband and five children: Frieda (nee Siems, born 16 April 1899) (Leo) Young, and Helmuth (Mina) Siems, both of Neillsville, Luella, Theodore (9 Sept 1921-17 Mar 2005) and Clara all at home. She was preceded in death by her parents, one son, Frederick (29 Nov 1925 ' 11 Mar 1927), and one grandson. Burial was made in the Neillsville Cemetery. July 1948: The Gottlieb Kuester home in Greenwood was the scene of an unusual reunion Sunday, July 4. After a separation of 34 years the six Kuester brothers found it possible to be together again. They were: Fred of Loyal, Christ from Keil, Gottlieb from Greenwood, William from Milwaukee, Henry of Sheboygan and Ferdinand of Neillsville. Mrs. Wilhemine Kuester, daughter of Wilhelm and Johanna(nee Girke) Reinke, was born May 6, 1864(UCC has born 6 Aug 1864) in the Town of Herman, Sheboygan Co, Wis. She was baptized in early infancy and confirmed on April 12, 1878. She spent her childhood and early youth in and about the Town of Herman. On April 25, 1888 (27 April 1888 per UCC) she was united in marriage with Gottlieb Kuester. (3 Mar 1866 ' 3 Nov 1954, son of Christian and Maria nee Zieman Kuester) Their union was blessed with six sons and two daughters. Three sons preceded her in death, dying in early infancy(UCC cemetery: Gilbert Gottlieb 5 Jan 1897 ' 26 Mar 1898; Albert Gustav 29 Dec 1899 ' 3 Jan 1900; Gustave, born and died 14 June 1902). One son, Henry, died in the year 1927, reach an age of 36 years (obit following). On the third of May 1888 she came with her husband to Clark Co and they settled on a farm in the Town of Warner, where she resided until her death. She became a member of the Immanuel Reformed Church in the year 1889, and has also been an active member of the Ladies Aid since it was organized. After a brief illness of about two weeks she was taken to her final reward on July 2, 1934, at the age of 70 years, 1 month and 26 days. She leaves to mourn her death, two daughters, Lydia (Mrs. Julius Dill), Greenwood, Wis.; Ella (Mrs. Albert Fravert) of the Town of Warner; two sons, Wilhelm and Norbert of the Town of Warner. Besides these she leaves to mourn her death three brothers, Herman, August and Charles Reinke of Sheboygan Co and one sister, Mrs. George Brill, Calumet, Mich. Funeral services were held from the Immanuel Reformed Church. Miss Lydia Kuester, daughter of Mr. and Mrs. Gottlieb Kuester, and Mr. Julius Dill, were united in marriage Sept. 16, 1911, at the home of the bride's parents on the West Side. The German Reformed of the West Side performing the ceremony. The bride was attended by her sister, Miss Ella Kuester and Miss Mamie Mund of Globe. The groom was attended by F.A. Horn and Henry Kuester, the latter being the bride's brother. Mr. and Mrs. Dill will go to housekeeping at once in the house just vacated by John Stafford. Services for Mrs. Lydia Martha Dill, 86, of Greenwood were held at Zion United Church of Christ. Mrs. Dill died Sept. 13, 1974 at St. Joseph's Hospital in Marshfield, where she was taken early that same morning following a stroke. Burial followed in the Greenwood Cemetery. Pallbearers, all grandsons, were William and Michael Mitte, Nick Matkovich, and Gary, Jack and Tom Abel. The former Lydia Martha Kuester was born June 10, 1888, northwest of Greenwood and lived most of her life here. Her marriage on Sept. 16, 1911, at the West Side Reformed Church at Greenwood was to Julius Dill. Survivors include four sons, Gottlieb, Milwaukee, Gilbert, Grafton, Henry, Chicago, and Harvey, at home four daughters, Mrs. Phillip (Alberta) Thomas, Las Vegas, Nev., Mrs. Adolph (Anita) Abel, Greenwood, Mrs. Louis (Beulah) Matkovich, Willard, and Mrs. Harold (Julia) Mitte, Neillsville; a brother, Norbert Kuester, Greenwood. Preceding her in death were two sons, Leo and Norbert; two brothers, Henry and William, and a sister, Mrs. Albert (Ella) Fravert. Oct. 22nd, 1913, at the home of Mr. and Mrs. G. Kuester of the West Side, the marriage of Henry Kuester and Miss Mamie Mundt was solemnized. The couple was attended by Wm. Kuester and Byron Mundt and Ella Kuester and Emma Goeke. Those who were present from away are: Mr. and Mrs. F. Kuester of Neillsville, Mr. and Mrs. Lucas of Plymouth, Mr. and Mrs. Chris Kuester, Mr. and Mrs. Henry Kuester of Sheboygan, Mr. and Mrs. Nick Ludovic of Dorchester and Mr. and Mrs. Henry Kreisch of Marshfield. Henry Kuester passed away at the hospital at Marshfield Sept. 7th, 1927 the cause of his death being heart trouble. Deceased was born in the town of Warner, March 23, 1891. On Oct. 22, 1913 he was united in marriage to Miss Mary Mundt (25 July 1890 ' 12 Feb 1957). This union was blessed with six children. Mr. Kuester had been ailing for about a year. About two and one half weeks ago he was taken to the hospital at Marshfield, and although everything with the power of medical science was done for him, he continued to decline. He leaves to mourn, his wife, five children, Dorothy, Edward, Leona, Lila and John, two brothers, William and Norbert, two sisters, Mrs. Albert Fravert and Mrs. Julius Dill, his parents, Mr. and Mrs. Gotlieb Kuester. One daughter, Evelyn, died in 1922. Funeral services were held from the West Side Reformed Church. The body was laid to rest in the West Side Cemetery. William C. Kuester, 80, a lifelong resident of the Greenwood area, died of a heart attack at Jan. 21, 1973. Services were held at the Hill Funeral Home in Greenwood, with burial in Greenwood cemetery. The Zion United Church of Christ in Greenwood officiated. Mr. Kuester was born on Dec. 15, 1892, in the town of Warner in Greenwood, and was married on May 7, 1914, to Emma Goeke at the Goeke home. His wife survives him. After marriage they farmed northwest of Greenwood until 1939, when they built the Parkway Club, one mile north of Greenwood, which they operated until 1959, when they retired and moved to the city of Greenwood. They celebrated their 50th wedding anniversary on Sunday May 10, 1964. Survivors include two daughters, Miss Loretta Kuester, at home, and Mrs. Douglas (Eldora) Luther of Merrill; two sons, Lawrence Kuester of St. Louis, Mo. ; and Leon Kuester of Greenwood; one sister, Mrs. Lydia Dill of Greenwood; one brother, Norbert Kuester of Greenwood. One brother, Henry Kuester and one sister, Ella Fravert, preceded him in death. Emma Kuester, 87, of 311 S. Eaton, Greenwood, died Dec. 27, 1983. Funeral services were at Zion United Church of Christ, Greenwood. Interment was in the Greenwood Cemetery. Emma Goeke was born to August and Lena (nee Stockmeier) Goeke on Aug. 5, 1896, at Newton, Wis. She received her education at Newton School. On May 7, 1914, she and William Kuester were married at Greenwood. They farmed in the Town of Warner until 1939, when they built the Parkway Club and ran that for 20 years. They later retired and moved to the City of Greenwood. Surviving her are one son, Leon of Greenwood, two daughters, Miss Loretta Kuester of Greenwood, and Mrs. Douglas (Eldora) Luther of Merrill. She was predeceased by her husband in Jan. 1973 her parents one son, Lawrence, three sisters and one brother. Norbert Kuester, 84, of Route 2, Greenwood, died Jan. 7, 1983. Funeral services were at Immanuel United Church of Christ, Greenwood. Burial was in the West Side Cemetery. Serving as pallbearers were grandsons, DaNeil Humke, Thomas Prall, Fred, Mark and Russell Awe and Jay LaBonte. Honorary pallbearers were Leon and Elmer Kuester, Walter Rasmussen, Harry and Arvin Liebzeit and Elmer Humke. Norbert Kuester was born on Sept. 4, 1898, in the Town of Warner to Gottlieb and Minnie (nee Reinke) Kuester. He received his education at the Benjamin School. He worked in the lumber camps with his father for many years. On June 7, 1923, he and Lena (Martha) Abel (21 May 1904 ' 27 Nov 1997) were married in the Town of Eaton. They observed their Golden wedding Anniversary in 1973. He farmed in the Town of Warner all his life, retiring in 1961. He is survived by his wife two daughters, Mrs. Calvin (Gladys) Awe of Owen and Mrs. Eldore (Violet) Humke of Greenwood. Preceding him in death were several brothers and sisters. Lilly M. Kuester, 98, Chetek, died Sept. 30, 2002, at Knapp Haven Nursing Home, Chetek. A memorial service was held at Immanuel United Church of Christ, Greenwood. Lilly M. Kuester was born on Aug. 7, 1904, in Greenwood, to Frederick and Alvina (nee Brandt) Kuester. She married Harold Kuester and was a seamstress and homemaker. Survivors include one son, Harold (Mimi) Kuester; three daughters, Karlyn (Gary) Kuester-Meinert, Sharon (Dan Hinton) Kuester, and Susan (Richard) Kuester-Kolterjohn; six grandchildren, Trish (Cameron Draws) Meinert, Tracy Meinert, Alison Kolterjohn, Melissa Kolterjohn, Graham (Deb) Kolterjohn and Sonia Kuester; one great-grandchild, Logan Meinert-Draws; two sisters, Elmira Mattes and Norma Ebert; one brother, Irwin Kuester. Preceding her in death were her parents; her husband, Harold, in December 1967; four brothers, Art Kuester, Elmer Kuester, George Kuester and Eddie Kuester; and one sister, Elvira Briski. UCC cemetery: Elmer Donald Kuester, b. 23 May 1913, d. 3 May 1997, married 25 Jan 1937 to Ursula Kutzler b. 28 Dec 1913, d. 26 April 1997. At the home of Mr. and Mrs. Henry Woepse, their daughter, Miss Evelyn was united in marriage to George Kuester, son of Mr. and Mrs. Fred Kuester. Miss Almira Horn was maid of honor, Ervin Kuester was best man. Mr. and Mrs. Kuester are spending the week at Milwaukee and Sheboygan. The young couple will reside with the bride's parents in the Town of Longwood, Clark Co.
Eveline Dorothy Kuester, 87, of Greenwood died Aug. 3, 2004, at Clark Co Health Care Center in Owen. A memorial service was held at Greenwood's Immanuel United Church of Christ. Inurnment followed in the church cemetery. Eveline was born March 17, 1917, to Henry and Johanna (Schmidt) Woepse on the home farm in the town of Longwood. She was united in marriage to George O. Kuester (George Otto 12 Mar 1912 ' 16 Nov 1998) on May 6, 1936. Her husband died Nov. 16, 1998. The couple farmed in the town of Longwood and later in the town of Warner until their retirement. She is survived by two sons, Jerrold (Nancy) Kuester, Holcombe, and Vernon "Butch" (Kathy) Kuester, Stanley; a daughter, Lola Venet, Withee. E. F. "Eddie" Kuester, 87, Greenville, Ohio, died Feb. 9, 1995, at the Brethren's Home. A memorial service was held at the First Presbyterian Church, Greenville. Burial was at Palestine Cemetery. He was born on Nov. 14, 1907, in Greenwood, Clark County, to Fred and Alvina (nee Brandt) Kuester. He graduated from Greenwood High School and the University of Wisconsin at Madison, where he majored in agriculture. He moved to Darke County, Ohio, on Oct. 1, 1930, when he was hired by Jackson School, now Mississinawa Valley. He married Alice Rush on June 23, 1935. She survives. He taught at Jackson School for 11 years, then went to teach Vo-Ag at Ansonia High School. In 1945, he became the agricultural extension agent for Darke Co until 1970. In the later 1980's, he received the alumnus citation from the University of Wisconsin for his work in agriculture. He was a member of First United Presbyterian Church in Greenville, where he had served as elder. Survivors include his wife four brothers, Arthur Kuester, Thorp: Irwin Kuester, Mount Olive, Ill. Elmer Kuester and George Kuester, both of Greenwood and three sisters, Lilly Kuester, Milwaukee; Norma Ebert, Loyal and Elmira Mattes, Thorp. He was preceded in death by his parents and one sister, Elvera Briski. Miss Elmira Mildred Kuester, daughter of Mr. and Mrs. Fred Kuester, town of Warner became the bride of Phillip Carl Mattes Jr., son of Phillip Mattes, Sr., town of Reseburg at a simple ceremony performed at the West Side Reformed Church. Miss Elvera Kuester, twin sister of the bride, and Irvin Kuester, Oak Park, Ill., a brother, attended the couple. Miss Elvera Kuester, daughter of Mr. and Mrs. Fred Kuester, Greenwood exchanged wedding vows with Tony Briski, son of Mr. and Mrs. Matt Briski, also of Greenwood, Jan. 30, 1943 in St. Louis, Mo. Mr. and Mrs. Briski will reside in Chicago where the groom is employed. Elvera Briski, 72, a former Greenwood, resident, died May 20, 1992. Services were held at Concordia Lutheran Church, Berwyn, Ill., Interment was in Mt. Auburn Cemetery, Stickney, Ill. She was born Jan. 26, 1919, in Greenwood. She married Tony Briski Jan. 30, 1943. Survivors include her husband, one daughter, two grandchildren, three sisters, Lilly Kuester, Chetek; Elmila Mattes, Thorp and Norma Ebert, Loyal and five brothers, Art Kuester, Stanley; Irven Kuester, Mt. Olive, Ill; Ed Kuester, Greenville, Ohio; George Kuester and Elmer Kuester, both of Greenwood. Miss Norma Kuester, daughter of Mr. and Mrs. Fred Kuester of the Town of Warner, and Walter Ebert, son of Frank Ebert of Colby, were united in marriage at the West Side Reformed Church. The attendants were Miss Lorinda Horn, niece of the groom and Elmer Kuester, brother of the bride. After the ceremony they left on a trip to Rochester, Minn. They will make their home on the groom's farm in the Town of Beaver. Norma M. Ebert, 94, Loyal, died May 2, 2004, at the House of the Dove Hospice Home, Marshfield. A memorial service was held at Immnanuel United Church of Christ, Greenwood. Burial was in the parish cemetery. Norma M. Kuester was born on Nov. 24, 1909, in rural Greenwood, to Fred and Alvina (nee Brandt) Kuester. She attended Decker School and worked in Milwaukee for a year following her education. She married Walter G. Ebert on September 24, 1932, at the Immanuel United Church of Christ, Greenwood. The couple farmed in the town of Beaver until 1947, and then were the owners/operators of the Loyal Hotel until 1970. She moved to the Thomas Apartments in 1984, and resided there until 2004. Her interests included sewing and traveling, but she had a special passion for playing cards. She will be sadly missed by her daughters, Lois (Darrel) Horn, Greenwood, Nan Jean (Milton) Molle, Abbotsford, and Karen (George) Steckl, Waukesha; eight grandchildren, Denise Horn, Marshfield, Amy (Brent) Horn-Delzer, Janesville, Melanie (Neil) Horn-Bottemiller, Prior Lake, Minn., Gregory (Jamie) Molle, Bloomington, Minn. Kimberly (Mark) Smiley, Maple Grove, Minn., David Steckl, Harvard, Ill., Jamie (Carrie) Steckl, Waukesha, and Chad (Michelle) Steckl, Waukesha; and one sister, Elmira Mattes, Thorp. Preceding her in death were her parents; her husband, Walter Ebert, on May 1, 1955; and her siblings, Lily, Art, Eddie, George, Elmer, Irwin and Elvera. Irwin N. Kuester, 87, Ettrick, died April 13, 2003, at Marinuka Manor, Galesville. Irwin N. Kuester was born on Sept. 29, 1915, in Greenwood, to Fred and Alvina (nee Brandt) Kuester. He married Frances Yurkovich on Feb. 7, 1939, in Chicago. They moved to Mt. Olive, Ill., and later to Galesville. Survivors include his wife, Frances; two daughters, Myrna (Richard) Gorka, Ettrick, and Donna Kuester, Elmwood Park, Ill and two sisters, Elmira Mattes, Thorp, and Norma Ebert, Loyal. Preceding him in death were his parents, one son, two sisters and four brothers.